There's a monster lurking in space -- and not just any monster, a monster galaxy! Galaxy NGC 1275 in the constellation Perseus is a highly active galaxy, emitting strong X-rays, probably generated by a massive black hole in the galaxy's heart. 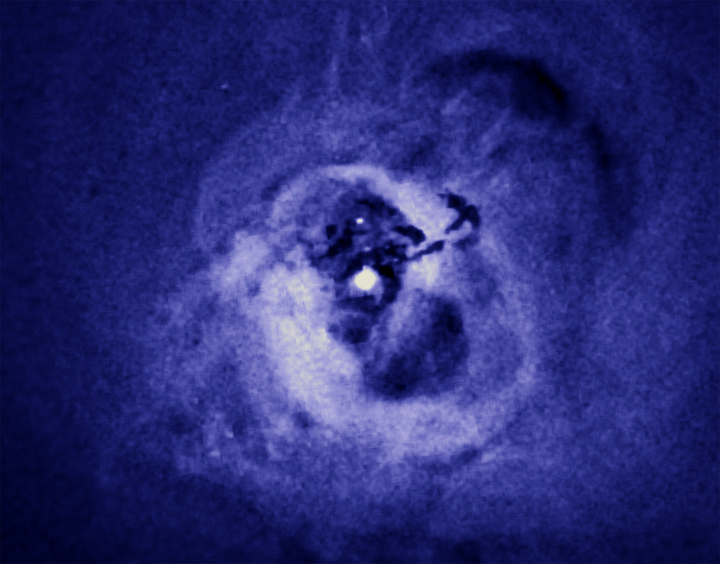 This image from the Chandra orbiting X-ray observatory even looks like a giant scary space monster. Who will save us? The good people at the Hobocon Web log were at GenCon last week, interviewing some of the exhibitors for a documentary they're filming. They were also kind enough to pick up copies of Bone Wars and Parasites Unleashed!, and have put up a very nice review of Parasites. According to this article, engineers at UC Davis are trying to devise ways for robots to sense "behavioral cues" in order to predict things like how another machine moves. This has immense potential -- one of the big obstacles for things like robot vehicles has been their inability to "read" the intentions of other drivers. If they can learn to anticipate behavior and react to cues, well . . . that would make robots better drivers than half the humans on the road right now. Of course, this also means humans would lose our key advantage over machines in poker. I'm back from GenCon Indy 2008, after 13 hours of driving. Here are my own, very subjective impressions. -- The convention was very well-attended. Industry insider gossip has the attendance at 5 or 6 percent above last year, which is pretty impressive given the jump in gas prices. -- One way the fans saved money was by not spending it in the dealer room. It wasn't a bad year, but nobody I talked to said it was fantastic, either. Certainly not the best sales year ever, despite the bigger crowds. -- There wasn't really any one single "gotta-have" product this year. Fantasy Flight Games had their Battlestar Galactica board game, and Privateer Press had Monsterpocalypse. Wizards of the Coast, of course, had the Fourth Edition of Dungeons & Dragons -- but that's been out in stores for months already. I don't think this is a bad thing, really. "Must-have" products in the past have sucked all the oxygen (i.e. dollars) out of the dealer room for everyone else. -- The most heavily-promoted item was Champions Online. Pretty much every flat surface in downtown Indianapolis had a Champions Online logo plastered on it. Rather impressive for an online game which won't even go live until 2009. -- In the roleplaying section, I was impressed enough by A Dirty World by Greg Stolze to buy a copy. -- Best meal: Mexican-style red snapper stuffed with octopus and shrimp at Huachinango, on the northwest side of Indianapolis. Heartily recommended. -- Worst meal: breakfast at a Bob Evans restaurant in Dayton on the homeward leg. Biscuits with the consistency of an art eraser, sausage patties cooked to hockey-puck toughness, a mix of underdone and overdone potatoes on the side, and coffee like weed killer. The place to have breakfast if you're planning a tri-state murder spree and want to get in the right frame of mind. -- Best side trip: The Air Force Museum in Dayton. I could have spent a week there instead of two hours on Monday morning. Also qualifies for Best Juxtaposition: the Wright Flyer replica hanging opposite an F-22 Raptor in the Modern Flight gallery. Tomorrow our crack team -- let's be honest, it's just me -- will head off to sunny Indianapolis for GenCon Indy 2008, the hobby game industry's annual big show. I'll be demonstrating PARASITES UNLEASHED! to all comers, and showing off BONE WARS as well. This year Zygote Games are partnering with Tangent Games in the exhibitor area, so stop by for a double helping of science-related fun! If possible, along the way home I hope to make a stop at the Air Force Museum in Dayton, Ohio. The Museum has a superb collection, including the only surviving examples of some aircraft, like the mighty B-36 Peacemaker. I can do this because of the stealthy ninja-like way I take down the booth when the dealer room closes. 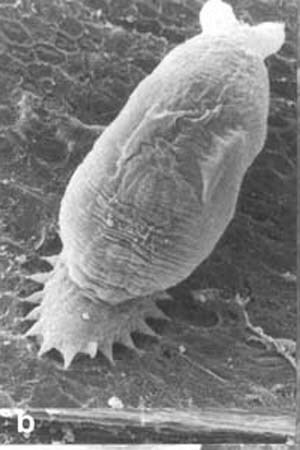 Dactylogyrus is a genus of tiny (less than 2 mm long) trematode worms which spend their lives anchored to their host fish's gills. Worms attach to the gill tissue using specialized hooks on the rear end of their bodies, leaving the mouth end free to forage on gill tissue. Mature worms release eggs each day; these sink to the mud and within a few days hatch into free-swimming larvae with a hankering for fish mucus and a time limit in which to find it. They have only about 4 to 6 hours to get pulled into a fish's mouth and grab onto its gills before they lose the ability to swim. August 7 marked the hundredth anniversary of the discovery of the famous Venus of Willendorf. The "Venus" is a small limestone figurine carved between 24,000 and 26,000 years ago. That makes her one of the oldest works of art made by human hands. In honor of the event, the Austrian Naturhistorisches Museum is having a big to-do, with public events, scholarly symposia, and a new stamp from the Austrian post office. The whole country is going nuts for a slightly heavyset lady four inches tall. Amid the festivities, let's hope the Austrians pause for a moment to remember Josef Szombathy, who discovered the Venus a century ago. A genuine pioneer in the study of ancient human civilizations, he perished at the hands of the Nazis in 1943. Remember the Big News about life on Mars? Well, it seems the Phoenix lander has identified perchlorate -- that's "bleach" to you and me -- in the soil. Not a good sign. While some "extremophile" bacteria on Earth can survive in the presence of the stuff, it's hard to imagine how life could have evolved in an environment of, in effect, Clorox. Which means either Mars is lifeless, this particular part of Mars is lifeless, or Martian life requires a very different chemical basis than life on Earth. On the plus side, this seems to eliminate any objection to humans moving in and fixing up the place. There's a lot of buzz going around about some potentially big news from Mars. Aviation Week is claiming that the White House has been briefed by NASA about discoveries concerning the possibility of life on Mars. This may just be rumor, possibly a garbled account of some relatively routine briefing about the recent Phoenix probe confirming the existence of ice under the Martian soil. Wired Science thinks it's just hype. So, to sum up: we're waiting for what is either the biggest discovery of the new millennium, or nothing much of importance. Stay tuned.